Of course, the challenge is how to extract insights from this rich data once it is captured. We’re talking about thousands of messages logged per minute from the various processes that are running. How does one successfully monitor and analyze all of this information? 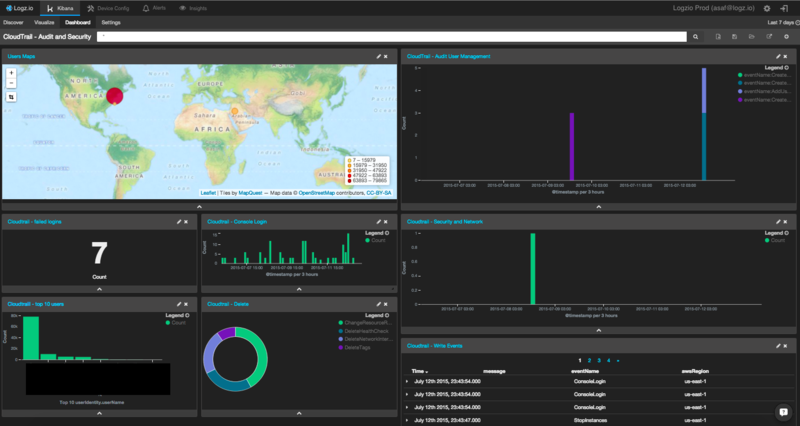 Sysdig’s cloud solution includes various visualization and analysis features such as dashboards and alerts, but if you opt for the open source Sysdig, you’re going to need to tap into an external data aggregation and analysis tool. 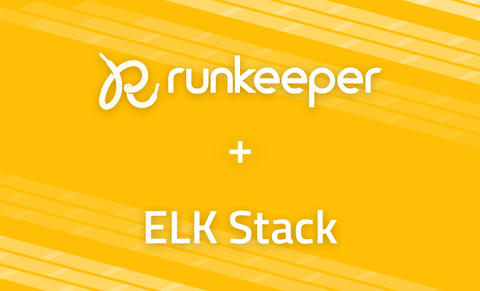 In comes the ELK Stack (Elasticsearch, Logstash, and Kibana). 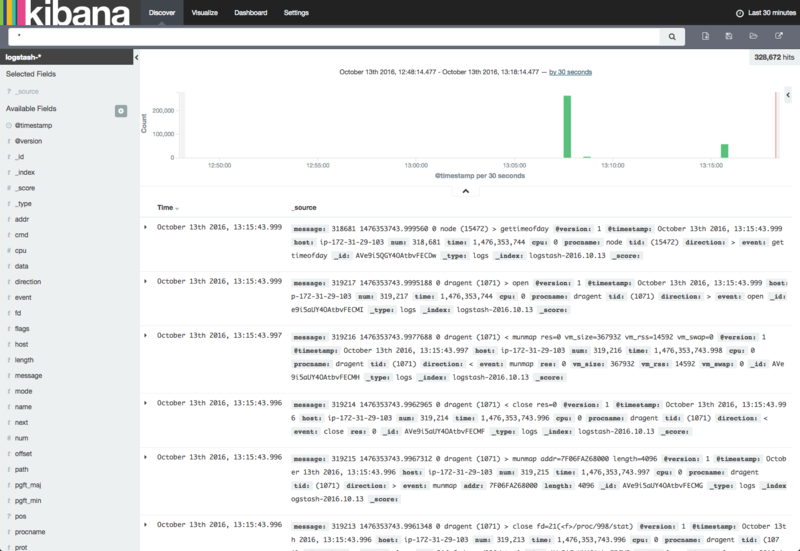 This post checks out the integration between Sysdig and ELK and details how to set up a local logging pipeline from Sysdig to Logstash to Elasticsearch and Kibana. My setup: Ubuntu 14.04, Java SDK 1.7, Elasticsearch 2.4, Logstash 2.4, and Kibana 4.5. While Sysdig does allow you to trace this output to a file, it is virtually impossible to access these log lines easily for analysis and visualization purposes. 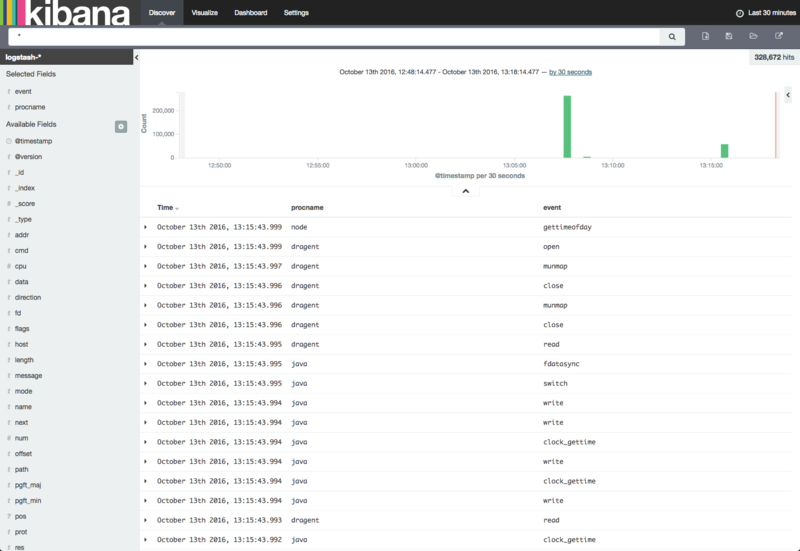 The next step is to configure Logstash to pull the Sysdig output and forward it to Elasticsearch for indexing. This configuration defines stdin as the input, applies a grok filter to the data, and sets a locally installed Elasticsearch instance as the output. Of course, if you’re using a remote deployment of Elasticsearch, you’ll want to add a “hosts” configuration line in the output section. 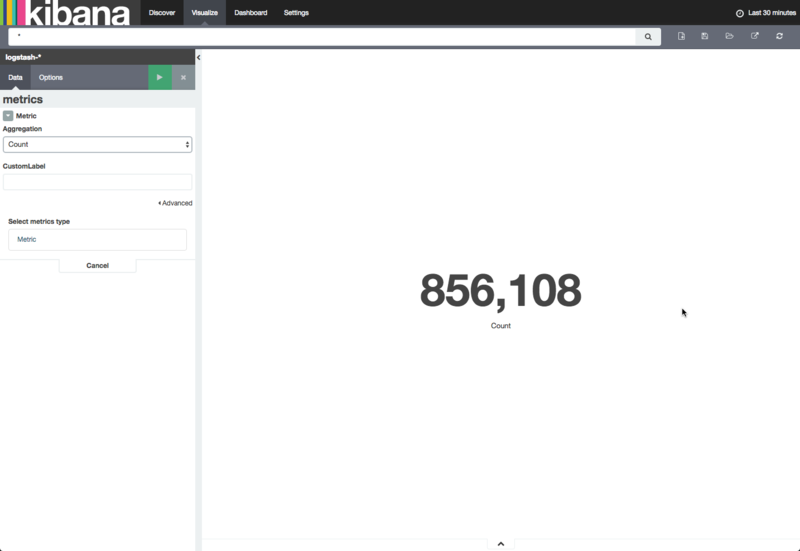 Our next step is to begin analyzing the data in Kibana, ELK’s user interface. We can now see the different processes being traced and which event they triggered. I recommend reading up on how to interpret Sysdig data before you begin analysis. Next up — visualizing the data. This is where the fun starts. 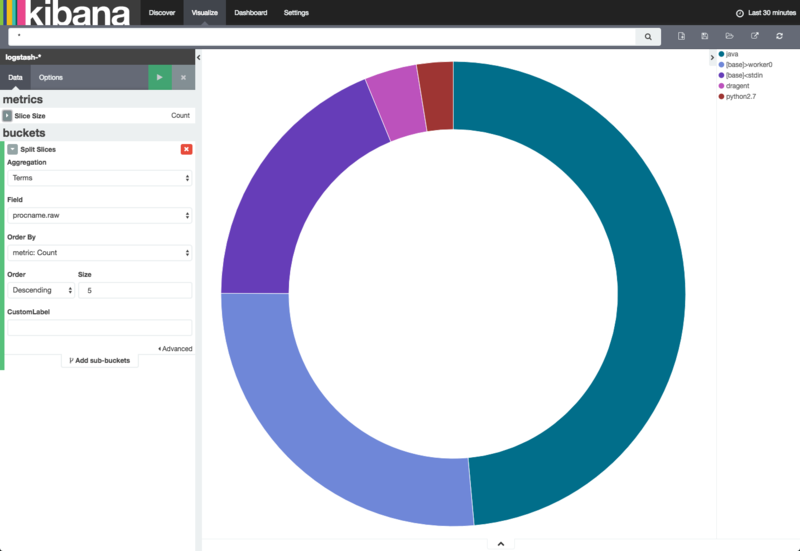 Kibana is renowned for its visualization features, but the truth is that it’s not always easy to fine-tune the visualizations to reflect exactly what we want to see in them (here’s a useful guide on how to create visualizations in Kibana). Let’s start with something simple. I’m going to create a simple metric visualization, showing the number of messages being traced by Sysdig in my machine. Not surprisingly, with both Elasticsearch and Logstash running on the same system, Java is ranking first at the top of the list. And so on. Once you have a series of these visualizations, collect them into one comprehensive dashboard for real-time system monitoring. This is because some of the fields outputted by Sysdig contain a dot ‘.’ A way around this is to install the Logstash de_dot plugin, a process not described here. The amount of data being shipped by Sysdig is quite large, and Logstash is prone to caving under heavy loads. In a sandbox type of environment, you can afford to ignore this. But if you scale the setup upwards a bit, you’re going to need some kind of buffering system. Elasticsearch mapping configurations are recommended to enhance the analysis of Sysdig data in Kibana. Out of the box, many Sysdig fields such as “procname” are reported as analyzed, meaning that they contain analyzed strings. These, in turn, consume a lot of memory and also do not visualize as expected (please note that in the pie chart visualization above, I used the ‘prodname_raw‘ field instead of ‘procname‘). Despite these reservations, there’s no doubt that with a bit of fine-tuning and the application of extra configurations, the combination between Sysdig and ELK offers great potential for a powerful solution that monitors systems and containers. With the soaring popularity of ELK and the growing need for effective system and container monitoring, I’m sure a tighter integration between the two is forthcoming. Anyone picking up the gauntlet?